Innovation always brings some form of change along the side. Thus, some is small, others big, change is inevitable when it comes to innovation. Considering these changes as a part of the innovation process is an advantage that will help you and your organization to better enabling new ways of working. So, before you set sails and make speedboats and experiments, take a second to look at the blast radius as well as the sphere of influence. This will help you take your speedboats into harbor. The blast radius is a way of finding the ripple effect the change will have in the organization. Visualizing this will help you think through the overall change and innovation initiative, and also provide transparency to the employees affected by your experiments. The first step is to brainstorm and list the intended and possible unintended consequences of introducing this specific initiative. Then ask yourself the following questions while either drawing on a whiteboard or filling out the template shown below. 1. Which departments, people, and management roles are directly and indirectly affected by the change? 2. 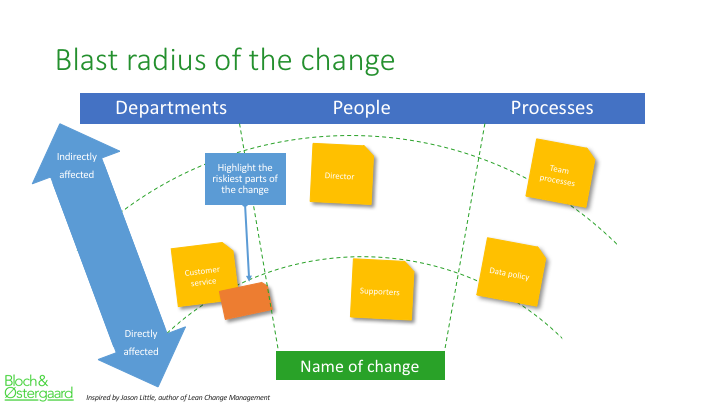 What processes would be directly or indirectly affected by the change? The purpose of looking at the blast radius and mapping who will be directly and indirectly affected is get a sense of what kind of change is hitting who. To some, the new initiative may be a simple change, but to others, it might be a more radical change. Knowing this, you’ll be able to follow up, help with the change, and making supporting actions for those directly affected. After working with your blast radius it’s a good idea to look at how you can reach influencers around the organization. Influencers will be able to help you spread awareness about the initiative and the change to come. 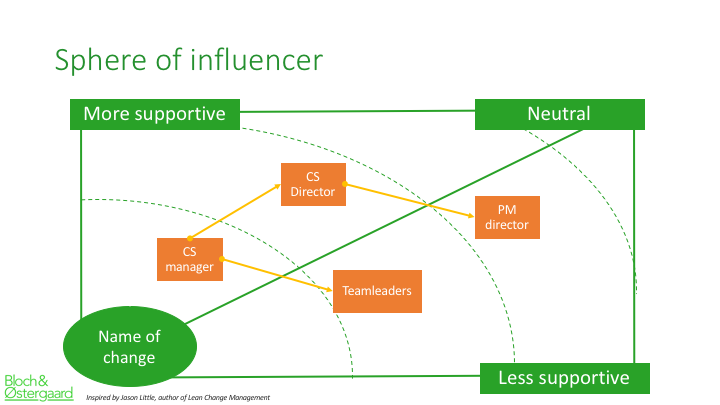 Without influencers, it can be difficult to get your employees on board with the change. The mapping will also make you realize how much (or little) work you have in front of you, driving the change. When mapping influencers, you’ll most certainly realize that you may not have a direct relationship with all of them. But don’t worry. This is also why we look at the sphere of influencers; to know who and where to start as well as whom will be able to make a connection to an influencer you yourself might not have a strong relationship with. First step is to either draw a circle in the bottom corner of a whiteboard (or use the template below). The circle represents the change you’re about to introduce. The second step is to write the names of influential people. This should be people with the power to support or kill the change. Maybe you’ve already an idea or maybe you should consider making an Organizational Network Analysis (ONA), which can show you relations and network structures within your organization. The last step is to use your network of people, by drawing lines between the names you have written. This will connect you to the influencers. From this you’ll gain a better understanding of where the support is, and isn’t, for the change. This critical insight will help you decide whether to commit or to abandon the experiment you’re about to make. Hopefully, it will should you the route to communicating about the changes of the experiment and thereby give you supporters who will help you drive the change, and your organization will succeed with being more innovative. Reference: We first learned about the Blast Radius and Sphere of Influence by Jason Little, author of the book Lean Change Management. and I’ll get back to you! 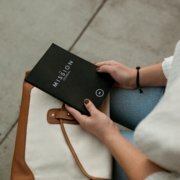 Do you need input on how to get started?